Busy weekend, including a canonization! | Walk with us! Busy weekend, including a canonization! SEPTEMBER 1, 2016 – This Sunday India will be celebrating the canonization of Mother Teresa of Kolkata. With Europe closer to us then the States the time difference is not so great and both CNN and BBC will telecast it live starting at 1:00 pm Indian time. The celebrations will be capped off with a Solemn Eucharistic Celebration at Vijnananilayam (school campus) in honor of India’s new aaint. It has been organized by CRI of Eluru (the conference of men and women religious) and will be presided over by Bishop Matthew Cherienkunnel, PIME, the bishop emeritus of Eluru. I believe this will be my first meeting with Bishop Matthew as he had retired before my first stay at Christu Dehon Nivas. Later on this afternoon our volleyball team will visit the Vincentians‘ De Paul minor seminary (Plus II) and college to play a friendly match. They played in last year’s tournament and won the trophy but were voted out of this year’s tournament since they are not a seminary/religious community. In addition, the school has about 2,000 students – far larger the any of the religious communities attending Vljnananilayam Institute of Philosophy and Religion. It certainly will be a good test of our skills as we prepare to meet the winner of today’s All Franciscan semi-finals. Since we will be playing this match at 4:00 pm I took my walk this morning and went to Vilnananilayam walking through their campus and found my way to the Sisters of St. Lucy compound where they also have a large school. One building celebrates the “giants” in India History and their fight for independence. 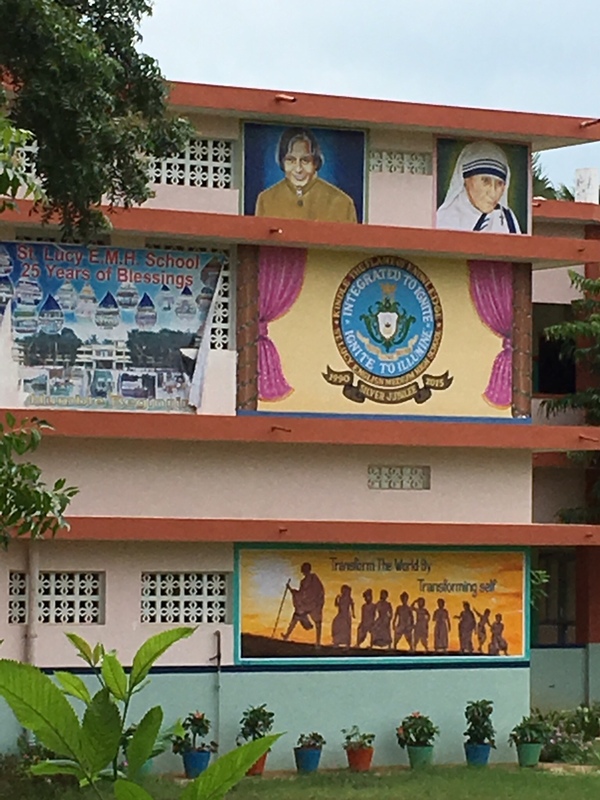 It also features other important figures, including Mother Teresa who you can see in the upper right hand corner of the top floor of the building. SEPTEMBER 2, 2016 – Now as for our busy weekend it gets off with a roaring start! This afternoon we have the bible competition pitting the various religious communities against each other to see which one knows their bible best. This year the sisters communities will be on equal footing and not have a separate match but will compete instead with their male counterparts on an equal footing. Our team consists of three members from last year’s quiz whizzes: Brs. 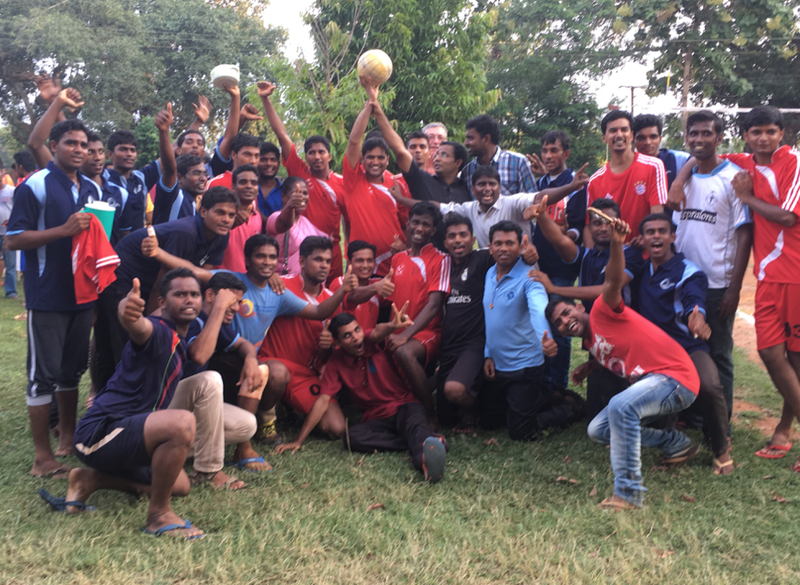 Mary Babu, SCJ (3rd year), Mahesh Gotikala, SCJ (2nd year), Meghanandha (Mega) Chakravarthy Bandanadham, SCJ (2nd year), plus Sajeet Pillai, SCJ, (2nd year) Moses Sayala, SCJ, (1st year) the team’s two rookies. While the event is scheduled to begin at 4:00 pm the actual contest won’t start for another hour or so. This year the area of the scriptures to be covered is taken from the prophetic literature namely: Isaiah and Jeremiah (major prophets) along with the minor prophets Jonah, Zechariah, Daniel and Zephaniah: We’re only allowed to bring three fans to watch (last year it was open to all) I intend to go but don’t know if we’ll stay until the end as we must travel to Sacred Heart parish Vempadu in the evening. Christu Dehon Nivas (CDN) has agreed to participate this school year in First Friday extended Adoration at Sacred Heart parish that tonight is schedule to begin at 7:30 pm and go until about 11:00 pm. Last month it really didn’t get started until around 8:30 pm so perhaps we’ll be able to finish the bible quiz as well. Tomorrow, thanks to the fact that some of the students have an exam in the morning, our activities will be limited to class Masses in the evening. I will be doing it with the fourth year (there are six in the class). This is the group that will graduate in November with four of them waiting to learn their regency assignments while Tinu and Vinoth who have already had their regency will upon the vote of the council make their final vows on December 8, 2016, and then await the date for their ordination to the diaconate and their deacon assignment, usually to a parish for a year before priesthood ordination in 2018. I will actually celebrate two Masses tomorrow as I have the 7:00 am Mass with the Holy Family Brothers community as well. On Sunday most of the brothers will go for their ministerial assignments in the morning. I believe all of the fourth year brothers have finished ministry work as they now turn their attention to preparing for their comprehensive exams in November (classes end next month). Most of the brothers will be back in time to watch the canonization of Mother Theresa that will be broadcast on CNN and BBC TV and I’m sure there will be some local channels televising it as well. I suspect we’ll watch it in English given the various languages spoken in the house. Finally, as I’ve mentioned in a previous journal entry there will be an evening Mass for the religious of Eluru with Most Reverend Jayarao Palemero, bishop of Eluru, along with his predecessor Most Reverend Matthew Cherienkunnel, PIME, bishop emeritus._ No doubt this Mass will be very well attended and I pray we don’t have any rain.